My kids favorite breakfast is blueberry pancakes made from scratch. Unfortunately, mom doesn't always have time to make these when requested. Fortunately, we do have a pre-packaged alternative that will help out in a pinch! 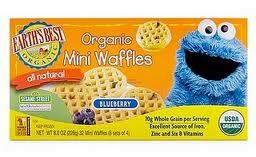 EARTH'S BEST ORGANIC Mini Waffles, Blueberry or Homestyle, distributed by the Hain Celestial Group, Inc., Melville, NY. Blueberry Ingredients include: WATER, ORGANIC WHOLEWHEAT FLOUR, ORGANIC EVAPORATED CANE JUICE, ORGANIC CANOLA AND/OR ORGANIC SOYBEAN OIL, LEAVENING (SODIUM ACID PYROPHOSPHATE, SODIUM BICARBONATE, MONOCALCIUM PHOSPHATE), ORGANIC BLUEBERRY PUREE, ORGANIC PEAR JUICE, NON-GMO SOY LECITHIN, NATURAL FLAVOR, SEA SALT, SODIUM ALGINATE, SODIUM CITRATE, CITRIC ACID, ORGANIC ELDERBERRY JUICE CONCENTRATE, DICALCIUM PHOSPHATE. Vitamins and Minerals: ZINC SULFATE, NIACINAMIDE, REDUCED IRON, VITAMIN B12, RIBOFLAVIN, PYRIDOXINE HYDROCHLORIDE, THIAMIN MONONITRATE, FOLIC ACID. CONTAINS: WHEAT, SOY. Manufactured in a facility that uses Milk and Eggs. Good Manufacturing Practices are used to prevent introduction of undeclared allergens. 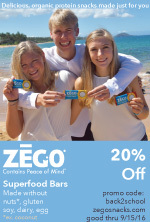 *Organic Ingredients grown without potentially harmful pesticides. *No artificial flavors, colors or preservatives. Their webpage is full of great information and resources! Can you really go wrong with a company which supports Sesame Street? Here's a link to my video spot with Boise COOP about these tasty waffles. As a reminder, my house is dairy/egg/nut-free and we have enjoyed this particular product for years! You may have to shop around to find them. In larger cities where I have lived, they are more easily found. Breakfast for dinner, anyone? We're ready! Hi! 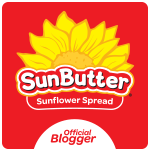 I just ran across your blog. our home is also milk, egg, nut free for my 3-year old son. Just tried these waffles and they are wonderful. Do you have any other convenience foods that you recommend that meet our criteria? We are rather new to this allergy-free lifestyle so looking for all the help we can get. Thanks so much in advance.